This guide is intended for technical specialists, sales specialists, sales engineers, IT architects, and other IT professionals who want to learn more about the SR550 server and consider its use in IT solutions. Systems management XClarity Controller (XCC) Standard, Advanced, or Enterprise (Pilot 4 chip), proactive platform alerts, XClarity Provisioning Manager, XClarity Essentials, XClarity Administrator, XClarity Energy Manager. Security features Power-on password, administrator's password, secure firmware updates, Trusted Platform Module (TPM) 1.2 or 2.0 (configurable UEFI setting). Optional lockable front bezel. Optional Trusted Cryptographic Module (TCM) (available only in China). Service and support Optional service upgrades are available through Lenovo Services: 2-hour or 4-hour response time, 6-hour or 24-hour committed service repair, warranty extension up to 5 years, 1-year or 2-year post-warranty extensions, YourDrive Your Data, Microcode Support, Enterprise Software Support, and Hardware Installation Services. The SR550 server supports one or two Intel Xeon Bronze, Silver, Gold, or Platinum processors of up to 125 W TDP. 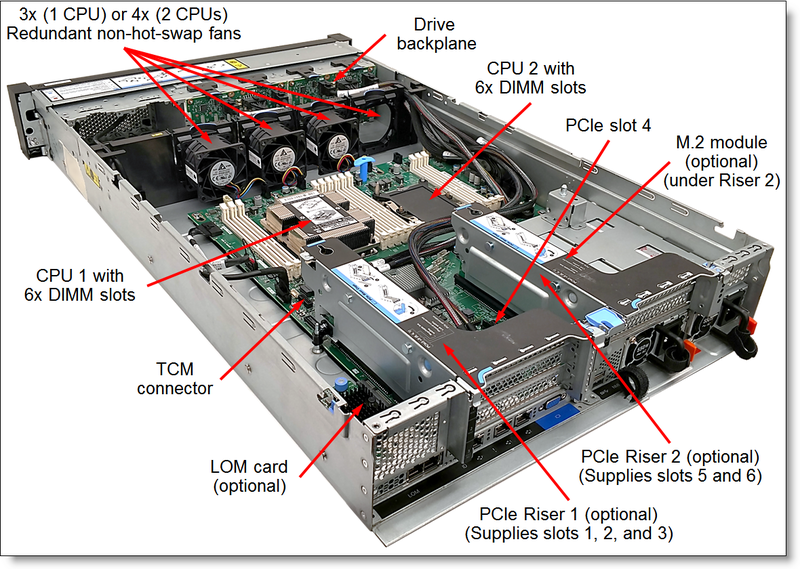 The following table lists the specifications of the processors for the SR550 server. For the SR550 server models that come standard with one processor, the second processor can be ordered, if required (see the following table for ordering information). The second processor must be of the same model as the first processor. The second processor option includes a processor, a heatsink, and an additional system fan. * For CTO configurations, the feature code represents a processor, and fans and heatsinks are derived by the configurator. The SR550 server supports up to 6 TruDDR4 memory DIMMs with one processor and up to 12 DIMMs when two processors are installed. Each processor has six memory channels, and there is a one DIMM per channel. RDIMMs: 384 GB (192 GB per processor). LRDIMMs: 768 GB (384 GB per processor). If memory mirroring is used, then DIMMs must be installed in pairs (a minimum of one pair per each processor), and both DIMMs in a pair must be identical in type and size. If memory rank sparing is used, then a minimum of one quad-rank DIMM or two single-rank or dual-rank DIMMs must be installed per populated channel (the DIMMs do not need being identical). In rank sparing mode, one rank of a DIMM in each populated channel is reserved as spare memory. The size of a rank varies depending on the DIMMs installed. The following table lists memory options available for the SR550 server. In addition, the SR550 server models can be configured with one or two internal M.2 SATA SSDs. The server also supports configurations without drive bays. The following table lists the internal storage options for the SR550 server. ** Field upgrade only; adds 8x 2.5" SAS/SATA hot-swap drive bays to the previously configured models that support drive bay expansion capabilities. The M.2 Enablement Kit (7Y37A01092) supports one M.2 SATA SSD which is connected to the SATA port on the Intel Platform Controller Hub (PCH). The M.2 with Mirroring Enablement Kit (7Y37A01093) is connected to the Intel PCH via the PCIe link, and the kit supports two M.2 SATA SSDs that can be configured in a RAID-1 or RAID-0 drive group, or they can operate as two separate drives. 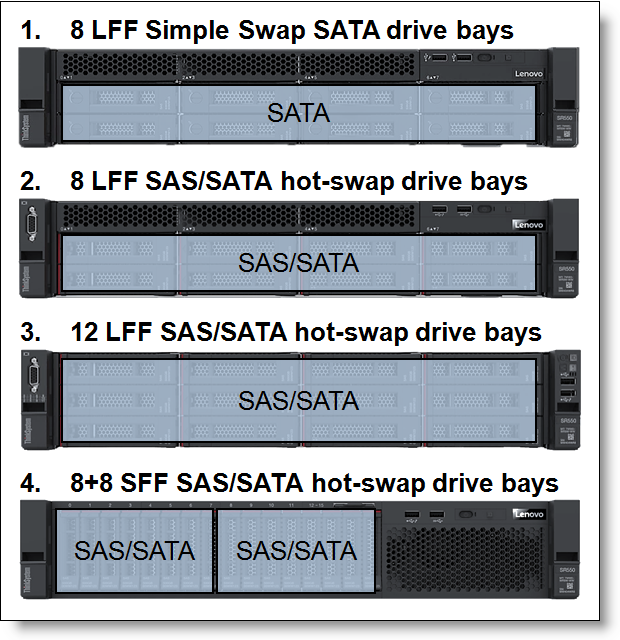 The following tables list supported internal storage configurations with the SAS/SATA backplanes. * The numbers in brackets (x or x+y) specify the quantity of drive bays connected to each of the controllers. Configuration note: Models without any drive bays are based on the 16x 2.5" chassis (feature code AV0R), and they support adding drive bays by using the 2.5" 8-drive backplane kit (7XH7A06254). The following table lists the storage controllers and options for internal storage of the SR550 server. ** Available in China only. Configuration note: Low profile SAS RAID controllers and HBAs for internal storage are supported in the PCIe x8 slot 4 on the system board and full-high PCIe x8 and x16 slots supplied by the riser card 1.